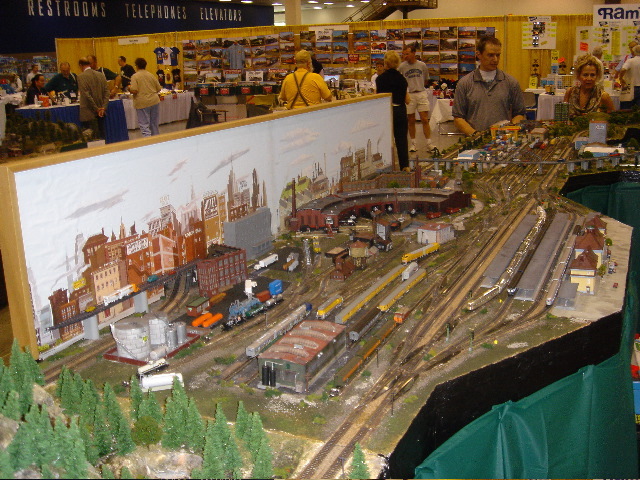 With the July excitement well behind us, it's time for a final look back at National Train Show from the perspective of us Northwest Pacific Z Scalers. 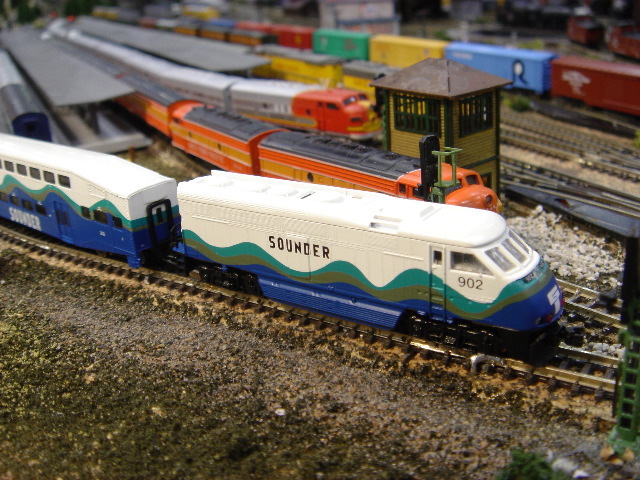 First of all, the National Train Show gave us Seattle locals a great opportunity to meet fellow Z scalers from around the country and around the world. Visitors included a few of the "movers and shakers" who have done so much to promote our small scale, as well as provide us with new models and technologies. 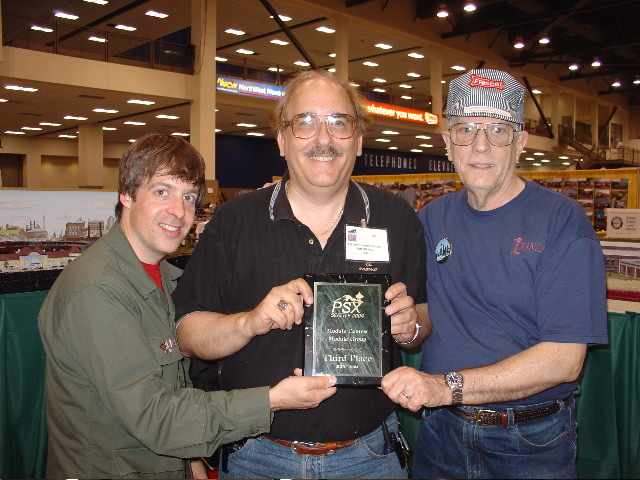 Z scale railroading has inspired a remarkably tight-knit and supportive online community, in which it's not unusual to strike up e-mail friendships with commercial manufacturers or publishers as well as private modelers. So it was wonderful to meet a number on on-line acquaintances face-to-face for the first time. Among our cast of characters were Rob Kluz of ZTrack Magazine, Hans Riddervold of American Z Lines, Harald and Ilona Freudenreich of FR (Freudenreich Feinwerktechnik), and James Shiff of SeaRails, to name just a few. 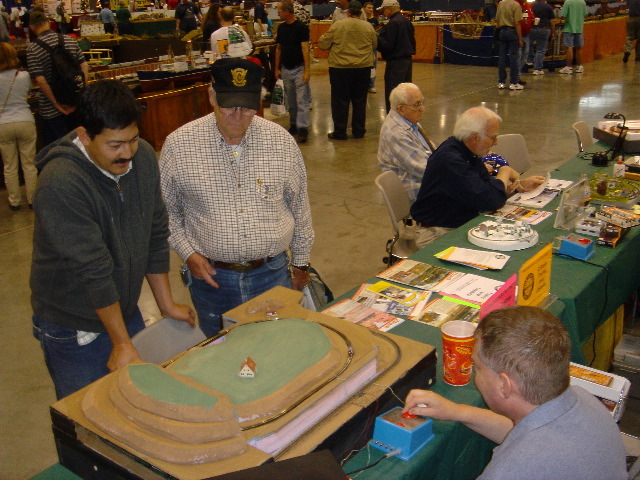 Terry Sutfin, longtime operator of the PoorVille and Debt City Railroad, was on hand with his well-traveled portable layout, and David George represented the Texas Z-scale community with his award-winning Golden-Blackhawk & Central City modules. 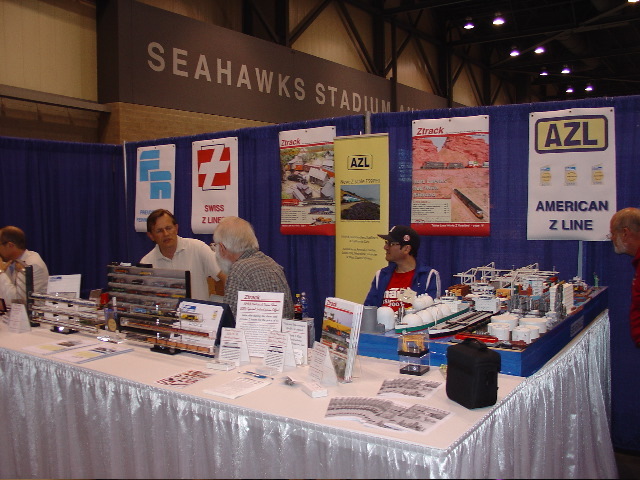 A motley crew of other Z modelers were on hand, as you'll see below, and much time was spent browsing between Z exhibits, swapping tips and stories as well as trackage rights on each other's layouts. One of the weekend's highlights was a big banquet on Saturday night, featuring most of the weekend's Z scale exhibitors. (We may model small, but we eat big!) 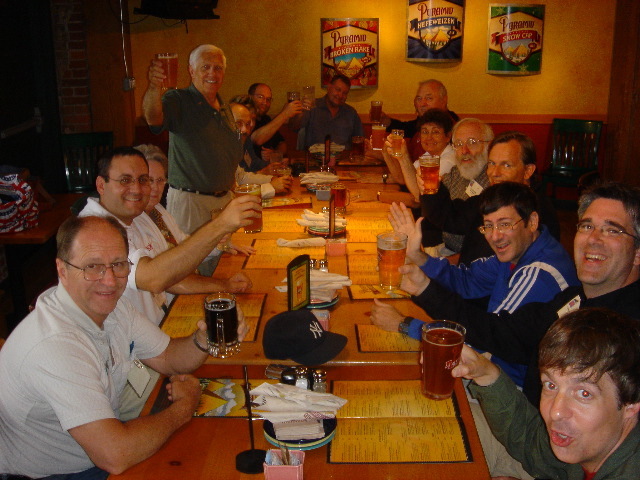 We capped off an evening of toasts and photo-taking with a group phone call to Jeffrey MacHan, who was unable to attend the show this year. 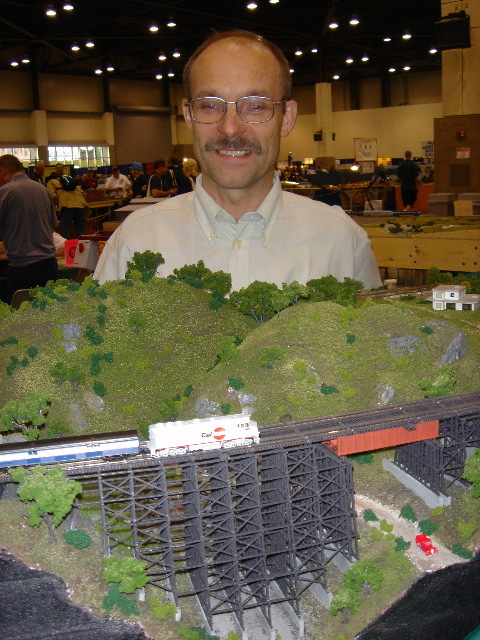 A resident of Montreal, Canada, Jeffrey has been perhaps the biggest promoter of Z scale in North America over the past decade, especially in his founding of the Z Scale online discussion group (groups.yahoo.com/group/z_scale). One of the exhibiting clubs cancelled before showtime, so the NTS coordinators were able to offer us an "upgrade" from our originally assigned spot to a much roomier piece of real estate right in the center of the convention hall. This meant that we could run our Bring Your Own Z (BYOZ) tables and our big modular layout right next to each other, with room to spare for any other modules or Z displays that happened to show up. We were able to set up about 15 feet of BYOZ tables along one side of our new area. Here walk-in Z-ers could display small layouts up to about 2 by 4 feet in size. 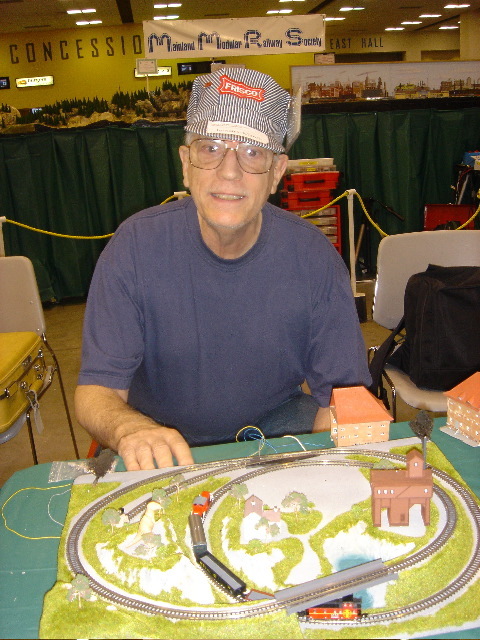 Jim Glass coordinated BYOZ activity, and as usual interacted with visitors of all ages and sizes from behind his miniature pre-formed Noch layout. Mark Million arrived with a European-themed layout he's working on. This included a loop of standard-guage track around the outside and a loop of Zm-guage track on top. (Zm is one-meter narrow guage in Z scale, a combination recently pioneered by the German firm Freudenreich Feinwerktechnik.) It was the first time I'd seen Zm in person. The tiny Swiss-prototype elecric locomotive and train ran beautifully. It was a real head-turner for visitors. 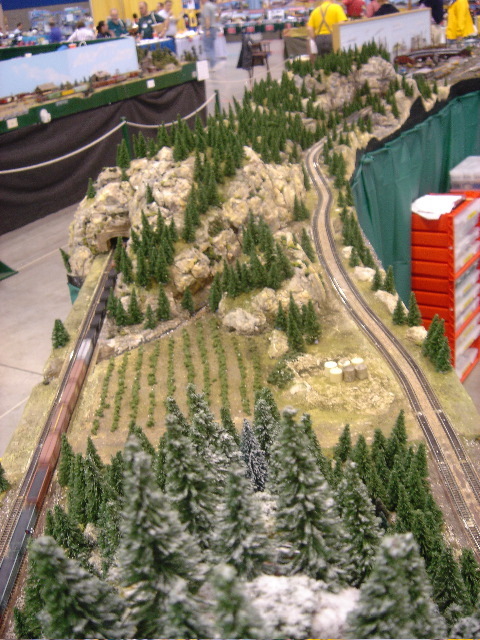 Loren Snyder brought an unfinished layout -- again with a European theme -- and worked on it throughout the weekend as conventioneers watched. 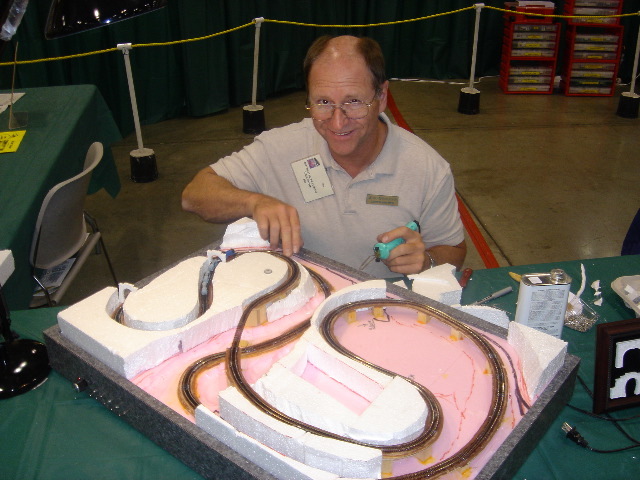 On a couple occasions, I thought I smelled something overheating on our modular layout, only to turn and spot Loren across the aisle, sculpting away at his foam landscape with a hot-wire tool. How I love the smell of burning polystyrene in the morning! Loren's creative use of MŠrklin #8510 curved track sections -- possibly the tightest sectional curves available in all of model railroading -- squeezes a lot of track into a tiny space. Unfortunately, Harold and Thea Oakley -- Northwest Pacific Z's resident European-prototype experts -- were unable to attend the show with some of their creations. Hopefully they'll be showing their work again this Fall. We arrived at the convention center on Thursday afternoon with about 36 feet of Z-Bend Track modules. Even at that late date, we didn't know exactly what our space would look like or what shape our modular layout would take. The Z-Bend Track module specs allow for a great deal of flexibility, so we decided beforehand that we would add or remove our own modules to accommodate whatever out-of-town modules arrived to join us. Unfortunately, our out-of-town guest modules never made it to the show. With our roomy new location, we could set up everything we brought. Some of our modules are bent at angles ranging from 10 to 30 degrees, so the overall layout formed a wide crescent shape. On Friday morning, we added a short, non-standard brachline module connected to a single-ended backshop module, changing the crescent to a very tall "E" shape. As always, wiring, troubleshooting, and skirting took us right up to doors-open time, but once our trains were underway the layout performed reliably throughout the show. The modular layout was kept in operation through the weekend by John Barrett, Tom Gilchrist, Jim Glass, and myself. Shows provide us a place to experiment with new ideas, and as usual our modules sported all sorts of brand new features. Buildings were newly illuminated from outside by street lamps and from within by welders, furnace fires, and more. A couple of modules that we had displayed half-completed at our last show now bore trees, grass, buildings, and traffic. Two modules had new block-power control panels, and three modules had working signals. Tom Gilchrist redesigned one of our oldest modules, taking a clever approach to give old trackage a new look. He mounted HO-scale backdrops on a stiff foam board and split the module into a large urban yard scene on one side and a small forest vignette on the other side. On the forest side, trains appear from and disappear back into the backdrop in a self-contained scene about the size of a window-planter box. On the broader city side, building flats and a road-to-nowhere freeway overpass blend the rail yard and roundhouse into the urban backdrop. We had the honor of granting track rights to some amazing new Z-scale creations. Hans Riddervold demonstrated AZL's new EMD F59PH locomotive and Bombardier cars on our modules for much of the weekend. Painted in the unmistakeable Sounder design, the train was a big hit with passersby, many of whom had just seen the real Sounder at the King Street Station just yards from the convention center. Harald Freudenreich had us give some serious track testing to two prototypes of FR's new F40 locomotive, both of them lettered in the Caltrain scheme. Robert Ray arrived with some beautifully detailed center-beam flatcars and bulkhead flatcars made of laser-cut wood, along with cast-resin covered hoppers and a pair of laser-cut cabooses. These looked wonderful displayed in the yard on the backshop module, and even better in consists on the mainline behind AZL diesels. 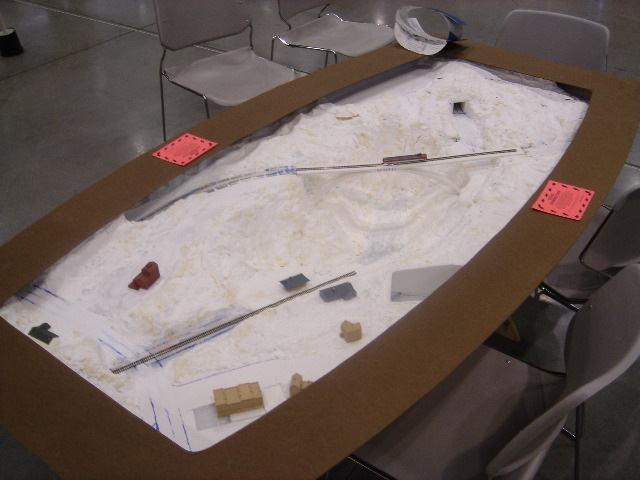 In the structure department, we worked some demonstration copies of new cast-resin products into our scenery. These included Nansen Street's sharply cast office-block flats, and a variety of containers, industrial tanks, and modular buildings manufactured by SeaRails. One of the weekend's biggest surprises came our way on Saturday morning, when the NTS awarded us third prize in the group module competition. The quality of work on layouts of all scales was very high throughout the show, so it was a big honor for our own workmanship to be placed so high by comparison. Jim Glass deserves special mention here, as he provided the judges with detailed descriptions of our work to help illustrate the amount of scratchbuilding and kitbashing we'd done in our small scale. I like to tell Jim he won the essay contest! 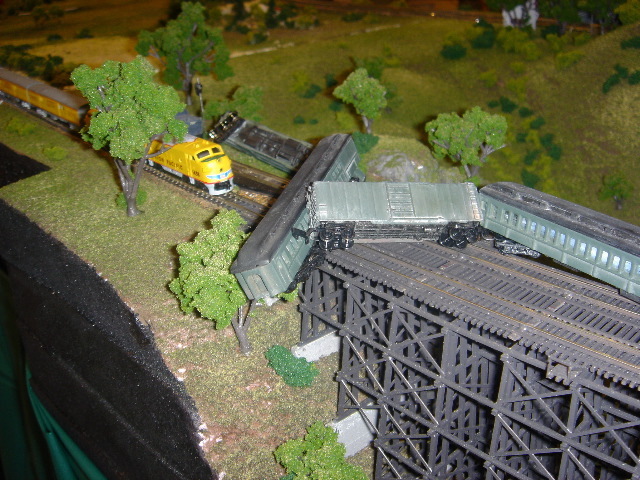 :-) Z scale layouts have won major awards in each of the last three National Train Shows, and it's great to be able to participate in continuing the tradition.